Cooks from nearby Mahaina Hotel man the food stalls at “Mahaina Yatai Mura” that is specifically set up for the festival. It’s a family-oriented festival coming up Sunday, at Yambaru Umi No Eki, the Sea Station in Yamakawa, Motobu Town. 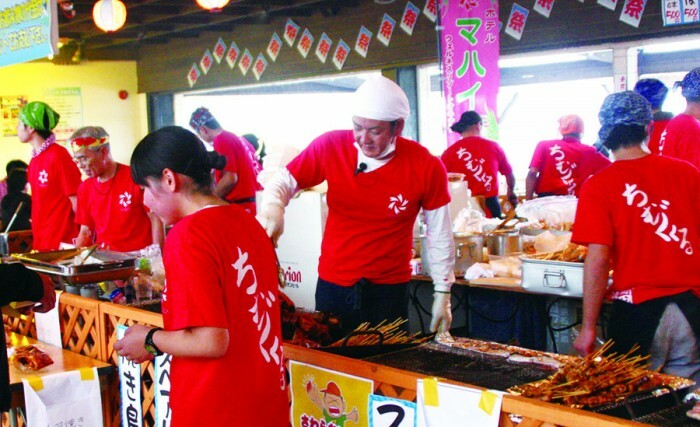 The free festival runs 1 p.m. ~ 9 p.m., with ‘Mahaina Village of Food Stalls’ and chefs from Hotel Mahaina on hand to cook, and demonstrate the tastes of Motobu. Organizers emphasize this is a family event, which families with even small children can enjoy. Motobu Nahkney, the king of Okinawa Folk songs, competition starts at 6 p.m.
Kid’s can try their hand at fish-catching. 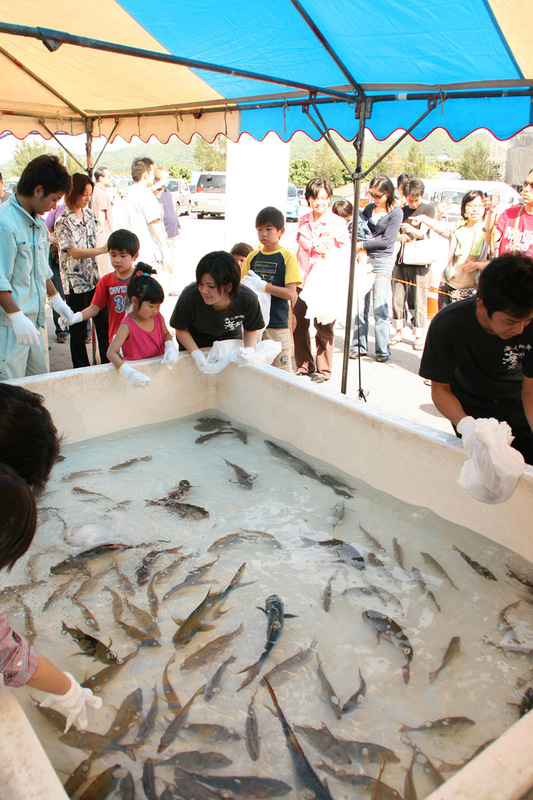 Motobu Child Yae Sakura performs at 1:15 p.m., followed by the Ryujin Mabuyer Show at 1:50 p.m. As the afternoon progresses, there are kids’ seaweed and live fish grabbing contests, which are free, but numbered tickets are required. Registration takes place at the Champloo Store beginning at 1 p.m. Registration is limited to the first 100 youngsters ages 5 ~ 12. 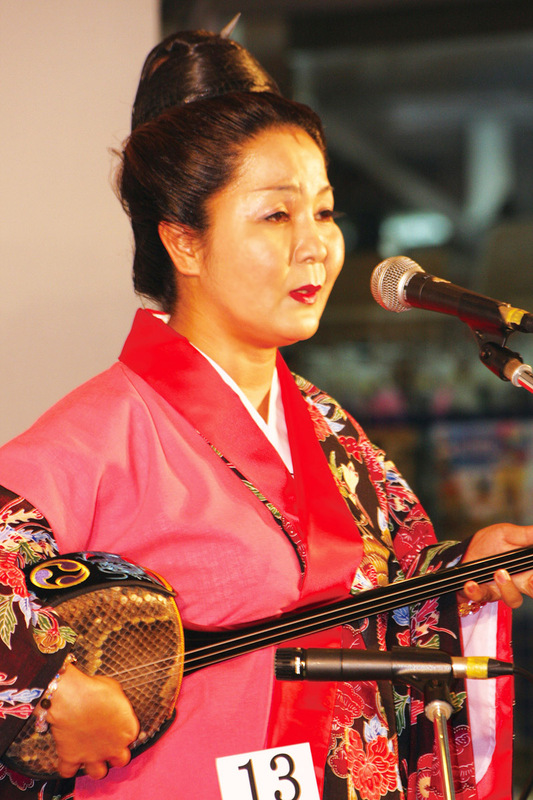 Hiroto Tamanchu is on stage at 4 p.m., followed by a Ryujin Mabuyer handshake event before Akira performs at 5:10 p.m. Motobu Nahkney, the king of Okinawa Folk songs, leads a competition at 6 p.m. There’s a Kids Village to be set up, complete with a traveling carnival. There will also be a sales market featuring Yambaru special products. The direct-sales market in Motobu begins at 1 p.m.
Yambaru Umi-no Eki is located across the street from Expo Park a couple of hundred meters before the park’s main gate and next to Mahaina Hotel.